The Department of Anatomy at FM&DC is actively involved and fully equipped for teaching and training the discipline of Anatomy to undergraduate students of MBBS with Dissection Hall, Museum and Histology Laboratory. The attached mortuary for holding dead bodies will enable hands on training of the students during dissection hours. The faculty of the department is highly qualified, methodological, interactive and student friendly. The teaching is clinically oriented with major stress on applied Anatomy. The teaching methods involve the use of modern teaching tools which include Multimedia, Close Circuit TV Camera for Projection of Histology Slides on the Monitor and state of the art models in the Museum. The Department of Physiology has a highly qualified faculty with vast experience of teaching and research. The department has a state of art laboratory equipped with all modern equipment’s required for training of competent future professionals. Teaching methodology in clinically oriented with special emphasis on the applied aspects of Physiology. Department actively interacts with all other departments particularly the Departments of Anatomy, Biochemistry and Pharmacology, Medicine and Surgery for integration between different basic and clinical subjects. The Department of Biochemistry at FM&DC is presently engaged in a programme of teaching & training students at the undergraduate level for the MBBS course in the subject of Biochemistry. The students thus equipped with the basic and advanced knowledge of Biochemistry are able to have a better understanding of other disciplines of medical sciences like Pathology, Pharmacology, Medicine and other clinical subjects. Modern teaching tools are used to facilitate the teaching process. Experimental aspects of Biochemistry is given due attention and the laboratory is well equipped for this purpose. Department of Pharmacology and Therapeutics at FM&DC facilitates acquirement of a broad educational background for the students which markedly enhances opportunities for postgraduate studies and future employment. Lecturers are delivered by highly experienced and qualified teachers. Wide areas of Pharmacology are covered in these lectures including General and Systemic Pharmacology (including drugs actions on organs and systems like autonomic nervous system, central nervous system, cardiovascular system, respiratory system, gastrointestinal system, drugs acting on kidneys, drugs affecting blood coagulation and homeostasis, hormones, anti-microbials anti-cancer drugs, immune-modulants and drugs acting on the eye). Special emphasis is laid on the mechanism of action, therapeutic uses, drug interaction and adverse effects of commonly used drugs. Students are also actively involved in tutorials, seminars and workshops to impart conceptual knowledge for problem based learning. The department is well equipped with an excellent laboratory for undergraduate studies where practical on various Pharmacodynamic aspects are conducted on living experimental animals, isolated tissues and organs in-situ. Department of Forensic Medicine & Toxicology covers two well organized specialties of Medical Sciences in their own right. Forensic Medicine applies to the principles & practice of medicine, elucidation of questions in judicial proceedings encompassing important aspects of medical sciences; while Toxicology involves all aspects of toxic agents including identification, harmful effects and various related medico legal inferences and covering aspects of environmental, occupational, analytical, Forensic & Clinical Toxicology. The two subjects require clinical examination, documentation & the certification of living and dead along with the interpretation of findings according to law of land; which are taught in detail in theory & practical classes as well as medico legal autopsy demonstration. The overall aim is to enable the third year MBBS students to develop alert sense for prompt perception of facts and learn the art of medical certification, report preparation and medico legal documentation. 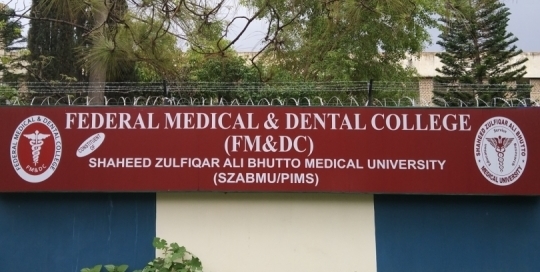 FM&DC has made a major commitment to community oriented medical education by affiliation with the Department of Community Health Sciences (CHS), Health Services Academy, Islamabad. The overall objective of CHS undergraduate medical curriculum is to participate in the development of community based field programs to address problems through primary health care and disease control methods; for which specific field demonstration sites in urban and rural areas have been setup. Community oriented medical teaching and training will continue through the undergrad period and includes the study and application of a wide range of social sciences, concepts of health economics, human behavior, socio-anthropology and social determinants of health and disease. The students will be encouraged to participate in the preventive and curative care and management of patients and their families in hospital out-patient department as well as primary health care field settings. Later on the study of epidemiology, demography and bio statistics would also be introduced at appropriate stages.